On a leafy street a few minutes' walk from the centre of Harrogate, this luxurious 100-year-old York stone building with free parking is set in picturesque gardens. The cocktail bar has a lounge area and there is free Wi-Fi in the hotel lobby. The hotel was recently voted one of the 'Top 5 UK Boutique Hotels' by The Guardian. 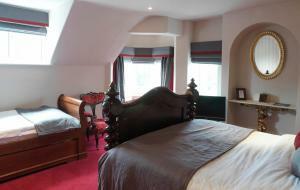 Its bedrooms have a stylish décor, plasma TV screens and Molton Brown toiletries. The boutique Balmoral Hotel has undergone extensive refurbishment and its atmosphere of relaxed, modern luxury extends from the foyer to the bar and suites. Guests also receive free passes to The Academy Spa. All of our rooms have been refurbished with opulent rich fabrics and classic furniture. Our bathrooms are fully tiled with fabulous showers, quirky baths and Molton Brown Toiletries. We aim to give you not only a night to remember but a peaceful night's rest. So whether it is for work or leisure why not give us a try. Breakfast is served in the New Grille restaurant on the ground floor. - Turn right out of the station down Station Parade to the corner of Cheltenham Park (about 100 metres). - Round the left hand corner and 1st right (Commercial Street) immediately after the traffic lights. - Continue straight down this road, over the crossroads and down the dip in the road. At the bottom of the dip turn left. This brings you out on the main road (Kings Road) opposite the conference centre. - Turn right into Kings Road. The Balmoral is a few hundred yards on the right. - Enter Harrogate past the Stray (open grass park) to the Prince of Wales roundabout. - Continue straight and take 2nd exit for town centre in the one way system. - Pass Betty's tearooms on the left, Cenotaph on right and keep in right lane down the hill to the traffic lights at the bottom. - Turn right into Kings Road then keep in left hand lane. Do not take the right filter as this takes you back into town. Pass the conference centre on your left and The Balmoral is a few hundred yards on the right. - Follow signs for Harrogate and continue through the set of traffic lights to the roundabout. - Take the 1st exit and after about a mile there is another roundabout (Prince of Wales roundabout). Take the 3rd exit for the town centre. - Keep on the A61 at the Royal Hall traffic lights and turn left into Kings Road. - Keep on the A59 through Starbeck for Harrogate. - Continue straight at the roundabout and after about a mile you will come to another roundabout (Prince of Wales Roundabout). Take the third exit towards the town centre and in the one way system. - As you approach Harrogate continue straight at the roundabout. - About a mile further on turn right onto the A61 at the next roundabout immediately after Great Mills DIY. - Keep on the A61 all the way into Harrogate until you get to the Royal Hall traffic lights. Keep in left hand lane. Do not take the right turn as this takes you back into town. Past the conference centre on your left and The Balmoral is a few hundred yards on the right.